Authors: Jan Emblemsvåg and Bert Bras. It is clear that our environment is changing, and not for the better. Companies cannot ignore environmental issues anymore. Public awareness is growing, legislation is tightening, and demand for ISO 14000 compliance is rising. 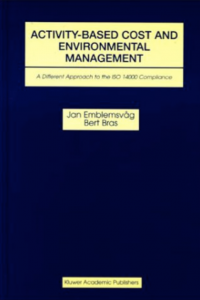 For many, however, the field of environmental management (including ISO 14000) is full of unfamiliar terms, high learning curves, unproductive approaches, much frustration, and often little action. If environmental management is to become widely accepted and self-motivated in industry, it must connect to the basic motivators for business: increased competitiveness and profitability. Activity-Based Cost And Environmental Management: A Different Approach to the ISO 14000 Compliance demonstrates how environmental assessment and management can be performed based upon familiar principles: cost accounting and cost management. Specifically, this book describes how the well-established Activity-Based Costing and Management principles can be extended with non-monetary environmental dimensions. The result is a single, integrated framework called Activity-Based Cost and Environmental Management that provides the tools and abilities to do both environmental management and cost management in an integrated manner and according to modern management principles. This integration of economic and environmental dimensions based upon familiar cost accounting and management principles makes it easier for decision-makers to not only include the environment in their decision-making, but also to identify, rank and prioritize opportunities for win-win situations where competitiveness is increased and environmental impact reduced at the same time. In this book, the basic concepts of Activity-Based Cost and Environmental Management are described, as well as how to make your own integrated Activity-Based Cost and Environmental Management implementations and how to get the most out of them using uncertainty distributions, Monte Carlo simulations, and sensitivity charts. Among others, the book includes chapters on environmental management and Activity-Based Costing, as well as several real-life case studies from companies for which the authors implemented Activity-Based Cost and Environmental Management system. … a major step forward in the field of environmental management.